This first-time event is a result of a unique collaboration between the City of Gulf Shores, the Coastal Alabama Business Chamber, Gulf Shores and Orange Beach Tourism, Alabama Gulf Coast Relay for Life, Gulf State Park, and Waterway Village merchants, including Acme Oyster House, Tacky Jacks and the Gulf Coast Arts Alliance (GCAA). The festivities kick off on Friday at 8 p.m. with the Wicked Warehouse, a haunted attraction. On Saturday, Oct. 24 the fun continues with a CASI chili cook-off, Trick or Trot 5K, scarecrow building contest, live music, children’s activities, a DJ, and the Wicked Warehouse. Tickets for the Wicked Warehouse are $5 and all proceeds benefit the Hugh S. Branyon Backcountry Trail. Saturday, Oct. 24: 4-10 p.m. 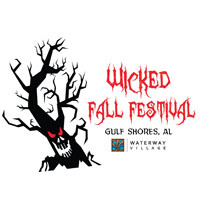 The Wicked Fall Festival will be located along East 24th Avenue in Gulf Shores. Admission is free to the public. Parking for the festival will be available at the Waterway Village public parking lot. East 24th Avenue will be closed to all traffic from the W.C. Holmes Bridge to Acme Oyster House. For more information, call 251-968-1423 or visit www.gulfshoresal.gov/wickedfest.